Ok, the first thing I have to say is THANK YOU to Mary Beth, at MB Things I Know. I saw this idea on her page a few weeks ago and I just HAD to give it a try. I knew I wanted to change it up just a little bit, but I didn't know how until the day I made it! You must have a Bundt pan for this cake. For a more real look it must be the one with the lines in it. I dislike making things you need specialty items for, but I am guessing most of you have a Bundt pan! You know every single time I type "Bundt" I am saying it in my head like the grooms mother on "My Big Fat Greek Wedding" BOONT. Now you are too. HA! The cake shown was completely frosted. I decided to do more of a poured fondant icing on mine. You do what you like I will just tell you how I got THIS cake. Preheat oven to suggested temperature on your cake mixes. Mix up both cake mixes in the same bowl, so your color ends up the same. Add food coloring to get your desired shade of orange and add vanilla. If you have 2 pans you can bake both at once, I had to do one at a time. Let it cool, remove from pan and then bake the other. When both cakes are cooled, turn them bottoms up and trim straight across so they will sit nicely on top of each other. Pick one of the cakes, and after trimming, use a spoon a dig a channel around the cake. Dig out about 1 1/2 inches deep and about that wide. You will be filling this up with the pudding you are about to make! Prepare pudding, using only HALF of the suggested milk. Whisk until creamy. The cakes should be completely cooled, and using a spoon fill that bottom layer up with the pudding. It should just come to the top of the channel you dug out, like this. 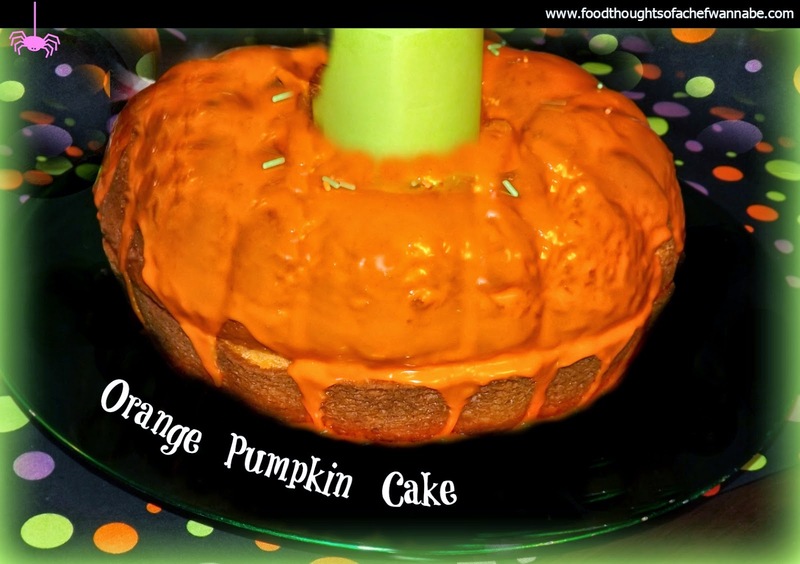 Now take the second cake and flip it over on top, so both flat sides are together, thus, making your pumpkin shape! ACCKK! You did it!! Next on to the icing! In a bowl add in powdered sugar, corn syrup, food coloring, and the zest from half of your orange. Now take that half orange and squeeze all of the juice from it. Squeeze HARD!! Now whisk to combine. If you want a thinner consistency add 1-2 T. of milk. It will all depend on how much orange juice you get but I needed 2 tablespoons. You want it to be pourable, but not to thin. Now take a spoon and start spooning it over the top of the cake, letting it drip. I suggest doing one layer, letting it sit a few minutes and then doing another layer. For the stem, use fondant, maybe a thick piece of branch that you have covered in saran wrap, some construction paper, or even maybe some flowers! This cake ROCKS! Perfect for fall or Halloween. If you are using it for Halloween, use black icing and make a jack-o-lantern face on it! !